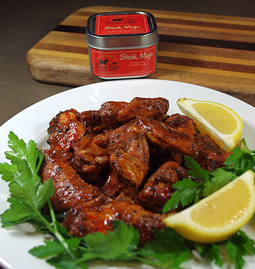 Steak Mojo Hot Wings - A recipe from Savor California, the online showcase for extraordinary gourmet foods and beverages from California. This is a really messy, wonderfully delicious recipe for wings. If you want, just grill the wings with Steak Mojo and enjoy! But if you want to add more flavor to your wings, cook them in the liquid ingredients after grilling. Prepare the wings by cutting the tips off and slicing the inside of the joint so it will lie flat, cooking more evenly. Sprinkle wings with Steak Mojo and add cayenne pepper if you want more heat. Grill the wings over direct heat until golden brown. When wings are done, place in a foil pan. Mix the liquid ingredients (reserve ½ cup). Pour the liquid ingredients over the wings in the aluminum pan. Stir to coat the wings. Put the pan on the grill and cook the meat for 30 minutes. Stir to keep the wings covered. Drizzle reserved liquid over the wings when serving. Serving suggestions: slices of radish and avocado. If the wings are too hot for some of your friends, put out a bowl of sour cream with chopped fresh parsley and a bit of fresh lemon juice to dip them in.